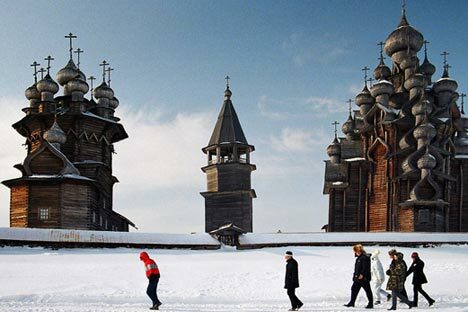 For most Russians, the island of Kizhi is the epitome of medieval wooden architecture: using no other tool but the carpenter's axe, unknown craftsmen created masterpieces of world architecture. Therefore, it is no wonder that the architectural ensemble of the Kizhi church complex (known as the Kizhi Pogost) was one of the first Russian sites to make the UNESCO World Cultural Heritage list– to be more precise, it was second after St. Petersburg and its suburbs. The Kizhi Pogost became one of the top attractions of northwest Russia and is a must-see item on the tourist and cultural agenda of all those visiting the capital of Karelia. The island’s main attraction is the Church of the Transfiguration, built in 1714. It is 37 metres high, featuring 22 church domes of different sizes arranged in a tiered cluster, all reaching towards heaven. The old masters achieved an astonishing effect: if you stare at the domes long enough, you get an impression of upward movement. This optical illusion results from the relative sizing and positioning of the domes along two adjacent verticals: they increase in size along one and decrease along the other. An additional marvel is that the church is built, as they say, without a single nail. The “scaly” roofing bits (called lemekh) covering the domes are made of carefully selected aspen, which should be neither too young nor too old. The most seasoned carpenter can make thirty wooden bits in one day – so that making enough for one church would take about two years. And now consider the volume of work required for twenty-two domes. In 2014, the grand-scale restoration works on the Church of the Transfiguration will be completed. Some 20-30 percent of the logs need replacing. The reconstruction is carried out using the authentic ancient lever device, called vag; this is exactly the same technique that was used 400 years ago.